· Jean-François Brunelière (UFSC) : French cars in Brazil, how two different worlds (Industry and Translation Studies) are (to be) linked. · Nina Tuđman Vuković (Projectus grupa d.o.o. Translation and Training Services) and Snježana Veselica Majhut (Zagreb University): The present and the future of research-industry cooperation in Croatia – the case of translation quality. · Lucile Davier (University of Geneva): Research About and With Newswires: A Swiss Success Story? · Hilary Footitt (University of Reading) and Angela Crack (University of Portsmouth): Cracking Collaboration? Don’t forget to fill in the structured message. The conference will be held at the campus of KU Leuven @ HU Brussel, in the city of Brussels (featured in the banner above). Information regarding lodging, dinning and sight-seeing can be found at the City of Brussels’s tourism website. The conference venue is only 30 min away from the biggest airport of Belgium: Brussels Airport. Take the train in Brussels Airport to Brussel-Centraal. You can find your route on www.belgianrail.be. 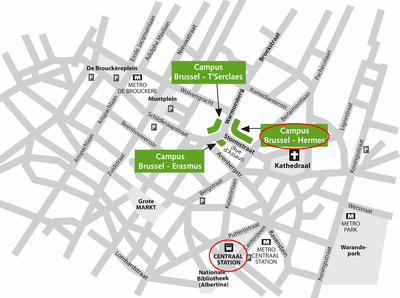 In Brussel-Centraal it only takes a 5 minute walk to the venue. Please find a map here.